Music is essentially twelve notes between any octave: 12 notes, and the octave repeat. It’s the same story told over and over, forever. All any artist can offer this world is how they see those twelve notes. That’s it. First-time director Bradley Cooper’s rendition is the fourth direct retelling of this classic showbiz love story / price of fame cautionary tale (there have been derivatives, of course, in dozens of other films). It’s been updated and retooled around another famous persona, this time with pop diva Lady Gaga following in the footsteps of Janet Gaynor, Judy Garland, and Barbra Streisand. Cooper is playing with the same set of twelve notes, but he attacks them with such assuredness that he weaves a spellbinding melodrama that feels just as heartbreaking and relevant now as it likely did in 1937. Some stories are timeless and their message bears repeating. And like the songwriters at the film’s center, this Star is Born has a lot to say. In front of the camera Cooper plays Jackson Maine, an aging rock star with a severe drinking problem who also happens to be going deaf. 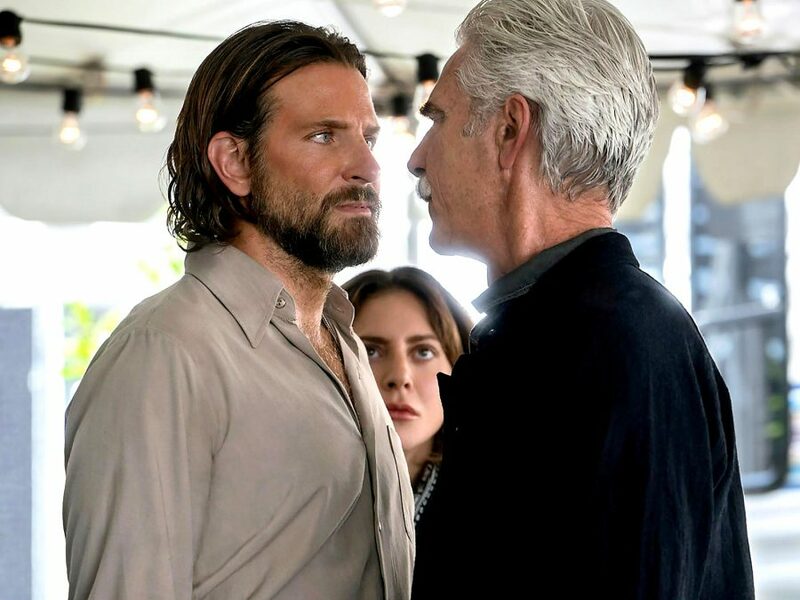 His (much) older brother Bobby (a career-best performance by Sam Elliott) does his best to wrangle him as his manager, but there’s a lot of past animosity bubbling under the surface. In search of late night booze after a concert, Jackson stumbles into a drag bar where he encounters our soon-to-be star Ally performing a gag-worthy version of “La Vie en Rose.” He’s immediately smitten by everything about her — her talent, her audacity, her singularity, and that nose. After she freestyles a song about him on the spot in a grocery store parking lot he has not only fallen hard, but become convinced that she’s a special artist with something to say. 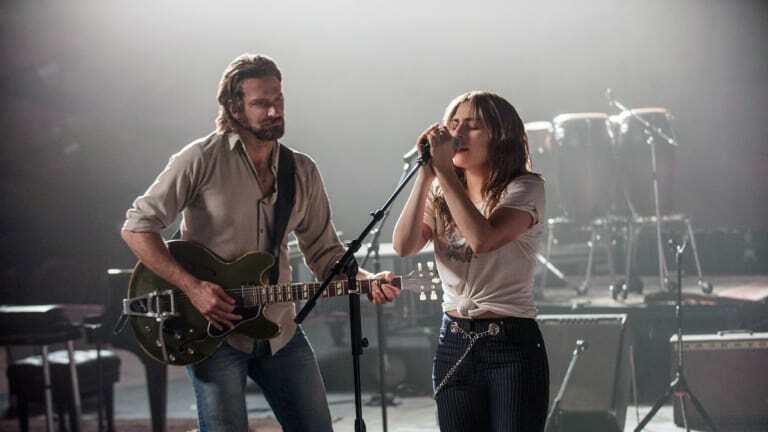 From there it’s a whirlwind tour for their ill-fated romance, and though the narrative veers in exactly the direction you know it will go, Cooper and Gaga’s natural chemistry is so sparkling that it remains riveting to the bitter end. Cooper and fellow screenwriters Eric Roth and Will Fetters populate the narrative with supporting characters that add rich histories and texture to both Ally and Jackson’s past, supporting the emotional throughline. Dave Chapelle’s “Noodles” (Jackson’s childhood friend) shows up midway through the film as a voice of sage wisdom amidst Jackson’s decline while also facilitating Jackson and Ally’s marriage. Anthony Ramos (of Hamilton fame) provides comfort and support as Ally’s longtime friend. D.J. “Shangela” Pierce plays Ally’s honorary drag mother with hilarious bite (along with a whole posse of quip ready queens). Andrew Dice Clay has memorable turn as Ally’s father, who — as he repeatedly claims — could have been a crooner if he had only had that “It” factor like Sinatra, showing that talent alone isn’t enough. And of course, there is Sam Elliott as Bobby Maine, who essentially raised Jackson after their parents died and is burying his own resentment after decades living in his more talented brother’s shadow. The legendary Elliott could have (and occasionally has) played this kind of role in his sleep, but instead he digs deep and is vulnerable to the core, dropping the tough guy persona to instead display a lifetime of love and unresolved bitterness in three key scenes (including the one quoted at the top of this review) that anchor the film’s themes. While the background textures lend the film legitimacy, it’s the direct parallels the screenwriters draw from Lady Gaga’s own personal life that make it sing. Having Jackson “discover” Ally in a drag bar mirrors Gaga’s own start in the New York scene. Ally’s insecurities with her looks come directly from Gaga’s own confessions. When Ally gets a manager and is forced to change her look and her own musical style it directly reflects the transformation Gaga herself has gone through in the past decade. It’s the perfect marriage of star and material, and Lady Gaga doesn’t just not disappoint in the role — she’s a revelation. There’s a naturalism to her performance that could only come from someone who has personally lived that experience, and when Ally hits her highs and her lows you believe them utterly. It remains to be seen if Lady Gaga will be able to move onto other projects that don’t directly play off of her own history, but what she accomplishes here is the crescendo of a career that has seen her go from wearing a meat dress at the 2010 VMAs, to singing a jazz album with Tony Bennett, to two musical performances at the Oscars (plus a nomination), to starring in what is likely to be a blockbuster film that may just land her an Oscar nomination for acting if not an outright win. That’s quite a trajectory for someone who was told she would “never make it” by the faculty at NYU. And it’s not as if this was an easy role to nail — Gaga had to fill the shoes of a few all-time Hollywood legends, and she exceeds all expectations. Gaga is not only a star, she’s a superlative artist and if this film is any indication, she’s just getting started.